Toon Aerts (Telenet-Fidea Lions) won the GP Sven Nys in Baal, the seventh and penultimate round of the DVV Trofee seies. 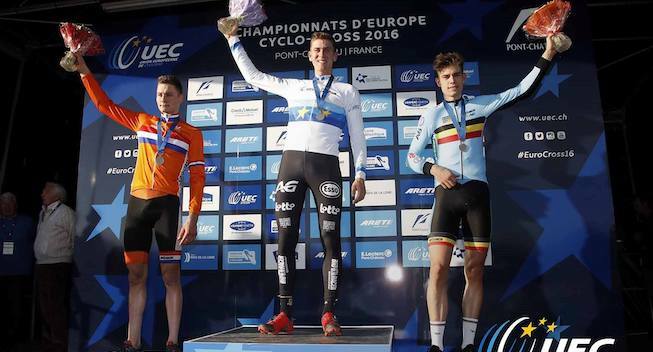 After a solor ide, the European champion held Wout van Aert (Crelan-Charles) off after the world champion had faced an off-day. Michael Vanthourenhout was third and Kevin Pauwels was fourth. It is the third victory of the season for Aerts. On New Year’s Day, the GP Sven Nys is traditionally on the menu, but this time the round of the DVV Trofee in Baal was held without the Cannibal himself. At the same time, it was the first time for Lars van der Haar to wear the colors of Telenet-Fidea and for Wout Van Aert to ride for Crelan Charles. The world champion was the man to beat in the absence of Mathieu van der Poel. He went into the race as the leader in the overall standings of the DVV Trofee with an advantage of 2.39 over Kevin Pauwels and 3.33 over Michael Vanthourenhout. The freezing temperatures had frosen the mud in Baal, forcing all riders to start very cautiously. Toon Aerts and Tom Meeusen took the most risks and in the first lap, the pair escaped. Further back, Van Aert took over the command, but it was soon evident that he didn’t have his best day: Aerts-Meeusen continued to increase their advantage, and in the background Wietse Bosmans, Kevin Pauwels, Michael Vanthourenhout and Tim Merlier joined Van Aert. In the fifth lap, the gap to the leading duo was big enough to allow the two teammates to ride against each other: Meeusen first had to let Aerts go when he slipped. After a crash, he even saw a fast Vanthourenhout pass him after the youngster had ridden away from the chasing group. European champion Aerts was already on the way to victory because as Vanthourenhout was unable to close the gap. Van Aert seemed to have resigned to an off-day halfway through the race but in the final laps he still went solo in attempt to catch Aerts. He soon passed Vanthourenhout, and even leader Aerts got worried when he saw Van Aert accelerating hard in the long straights. In the end, he still had eight seconds to spare to secure the victory while Van Aert had to settle for second place. Michael Vanthourenhout was third, Kevin Pauwels fourth. Tom Meeusen collapsed completely and was only tenth after a blistering first half of the race. 23-year-old Aerts follows in the footsteps of Van Aert who has won the GP Sven Nys the past two years. For the European champion is the third victory of the season. The world champion remains comfortable leader in the overall standings. On February 4, the Krawatencross in Lille is the final race of the DVV Trofee.